Should we stop using the term “pseudoscience”? 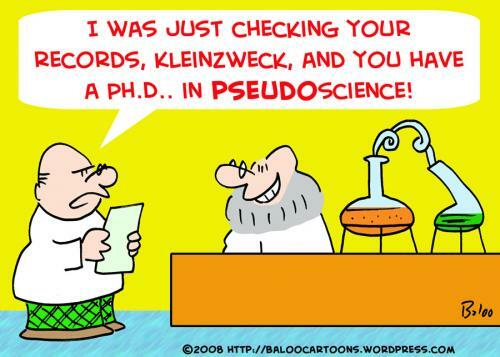 The term “pseudoscience” is obviously pejorative. Nobody wishes whatever he does to be labeled with that appellative. Recently, Katie Burke has written an essay for American Scientist arguing that we should drop it altogether. It isn’t the first time someone makes this suggestion, and I’m betting it won’t be the last one. Here is why Burke and others are wrong. This is an important point, since scientific standards change through time — as they ought to, if science makes progress — so that a certain body of evidence may fit such standards at one point, but not later on. Take, for instance, phrenology. One can reasonably argue that it was a notion to be debated in the early part of the 19th century, when it was popular. But anyone practicing phrenology today would unquestionably be relegated to the category of a pseudoscientist. Let’s stop here for a second and unpack that passage. The fact that a term is divisive is irrelevant to whether journalists or anyone else should use it. “Liberal” (or “conservative”) is a highly divisive term, but it does identify two broadly distinct — if varied — constituencies of people, whose interests, ideologies, and behavior at the poll are in fact statistically well differentiated from each other. Further, I’m not sure where Burke gets the idea that the term lacks scientific (or, more properly, philosophical) normativity, since there is a large literature on pseudoscience — including my co-edited (with Maarten Boudry) collection of essays, which she cites, likely without having read it — establishing precisely such norms. As for journalistic standards, I wonder whether journalists have “norms” for the use of any other divisive term, such as liberal, conservative, pro-choice, pro-life, race, and so forth. If so, I’d like to know where such norms are published, and on whose authorities they are being deployed. Finally, yes, “pseudoscience” has been used to defame certain notions, though we’ll return in a minute to Burke’s questionable examples of such defamations, but — again — so have plenty of other terms that journalists keep using nonetheless, like all of those listed in the previous paragraph. Well, yes, because there are such people. Vaccines are “real” science, antivaxx rhetoric is not. Astronomy is “real” science, astrology is not. And so forth. I get that the people who find themselves on the “pseudo” side of that divide won’t like it, but life is tough, isn’t it? Next, Burke provides her readers with three more examples of allegedly questionable use of “pseudoscience”: many (but unspecified) areas of psychology, continental drift, and eugenics. The latter is in the same category as phrenology, i.e., a notion that originally held some degree of scientific credibility — at the time of Francis Galton — and then slid into pseudoscience, so it doesn’t represent a problem for my account. The other two are interesting. I am not aware of Richard Wegener’s theory of continental drift ever having been labeled pseudoscience, tough it might have. It was, for sure, a controversial theory for a number of reasons, including the lack of a mechanism underlying it. Eventually it became accepted and is firmly entrenched in modern geology — so that if someone did call it pseudoscience, the label doesn’t seem to have brought about long lasting negative effects. The unspecified “areas of psychology” bit in Burke’s article has a link, which leads to a book chapter that refers to a hodgepodge of notions, including IQ measurements, Skinnerian behaviorism, and parapsychology. The latter is clearly considered pseudoscience by a consensus of competent researchers, while the other two are, respectively, controversial (politically as well as scientifically) and superseded (as a scientific theory). Sure, someone, somewhere, has used the term “pseudoscience” where it doesn’t seem to properly belong. I don’t think that the concept of IQ is pseudoscientific, it is more likely only marginally relevant to the study of intelligence; and I don’t think Skinner was a pseudoscientist either, but his ideas have indeed been superseded by developments in cognitive science over the last several decades. Again, though, if we stopped using a word because someone misapplies it for ideological reasons, we would have to excise a good portion of our dictionaries. It is far better to engage in a case-by-case discussion and inquire into the validity of this or that label, given currently acceptable epistemic standards. I’d also like to notice that the examples mentioned by Burke are taken from a book entitled Deconstructing Social Psychology, which has a distinctly postmodern flavor to it (including a chapter on something called “psychoanalytic feminism,” whatever that is). Maybe it does, maybe it doesn’t. But scientific racism is a pseudoscience, and it is widely recognized — again by the relevant epistemic community — as such. The political use of pseudoscience is a very interesting topic, but one that seems to me entirely distinct from whether a notion is or is not pseudoscientific. After all, actual science also has political uses, sometimes positive, sometimes nefarious. The link accompanying that bit? To literature on “indigenous science.” I may have more to say about this particular topic soon, since I’ve been invited to a conference in Canada early next year on attempts to teach indigenous medicine in university curricula, but for now I maintain that there is no such thing as Native American, or Chinese, or whatever, science. There are bodies of local knowledge, which should be (and often are, nowadays) appreciated for what they are but still need to be subjected to the more rigorous standards of systematic observations and controlled experiments. Those are the standards that help us figure out whether a notion has theoretical or empirical validity or not. And what characterizes a pseudoscientific stand is the insistence on passing for science notions that have, in fact, repeatedly failed those standards — regardless of which ethnic group, gender, political group, and so forth originally proposed those notions. Well, if it does, I’d like to see some solid empirical evidence of that causal link. But the author does have a point concerning a connection between scientism and pseudoscience. As I will argue in a chapter of a forthcoming collection also co-edited with Maarten Boudry, on the varieties of scientism (out next year by Chicago Press) in some sense pseudoscience and scientism are mirror images of each other, each the offspring of a priori ideological positions, not of sound empirical investigation or cogent philosophical arguments. Burke concludes with a series of alternative suggestions to the use of pseudoscience, so let’s take a look. But we, in fact, already do all of that! Except that some ideas don’t simply “lack scientific evidence,” and yet they are not “fraud or fabrication,” nor are they simply the result of “misinformation,” and they are certainly not “still-experimental.” They are, well, pseudoscientific! Look, I get it: labeling something a pseudoscience carries the danger of alienating people and of discouraging research into potentially interesting areas. But not doing so also carries risks, in particular that of lending legitimacy to notions that shouldn’t have it, some of which notions are positively dangerous for people’s health (homeopathy, antivaxx) or even the future of the planet (climate change denialism). So it isn’t a question of not labeling, but rather of labeling as accurately as possible, and of supporting whatever label one wishes to use (including that of “science” or “scientific”) with good arguments and solid empirical evidence. This entry was posted in Philosophy of Science on September 6, 2016 by Massimo. It seems to me that there is quite a good deal of bunk that doesn’t even pretend to be scientific. To clarify, I don’t know why I said “somewhat clearly”, I think pseudoscience can be defined clearly, and I don’t think the term should be dropped. Ok. Pseudo-science is a subset of bunk. There’s seems a circularity to Massimo’s comment that perhaps I mistake or wrongly attribute. Does this claim defeat Burke’s several qualifications or does the cited comment defeat or suggest a fundamental disagreement with Massimo’s earlier comment? To my mind, it doesn’t. The suggestion is that Burke’s contention to dispense with the overuse of a term that has come to be used as a pejorative is incorrect and, instead, her claim to state explicitly how and why a scientific theory is amiss (as both actually appear to suggest) should somewise be deflected to allow elbow room for those who want engage in conceptual contortions regarding the term itself. Lots of ‘junk’ science in the court room. This is not necessarily pseudo science since many of these techniques could be made to work if properly, double blind validations were done. E.g., the forensic examiner often (maybe nearly always) knows which sample are which and what their significance to his employers (usually the state) is. Even the ‘gold standard’ of finger prints has not been properly validated. Some techniques like fiber analysis (Wayne Williams) border on pseudo science. We need the methods to be validated, the experts to be independent and ‘blind’. It would cost some money. Why does philosophy so often descend into these disputes about words? Neither I nor anyone else is going to stop using the term ‘Pseudo Science’ to characterize Pseudo Science. If it quack like a duck, why not call it a duck? We will in any case call it a duck. Taking EduYears as an example and knowing it correlated with 76 loci to various degrees, what I meant was that those 76 loci, individually and in groups of various sizes, also correlate in complex ways with other behaviors, and I think that that along with what others have said is one more reason why complex trait manipulation like religiosity cannot be said to work. I’m not questioning genetic manipulation but I wonder why the term eugenics with all its negative connotations would be used for disease treatment. Pseudo Science and more. Currently on Rachael Maddow – apparently Hillary apparently as MS, Parkinson’s strokes, use a wheel chair, etc. and Trump son re-twitted it! And Sandy Hook was faked! Makes us simple JFK buffs look sane. Robin, you didn’t say anything naughty, but you did insert more than one link in your post, so the system automatically blocked it. It is published now.